DUDE YOUR EGGS ARE OVER COOKED! The Yolk should be watery like when an egg is cooked over easy. Having a yolk cooked LIKE THAT... Means you are trying to get some serious colesteral passed on to your patrons. Someone should report you. Called HARD BOILED EGGS .. you DIP! LoL.............. ;D : Ok I am staying out of this. Have fun. Eggs are one of the most versatile forms of nourishment available. Nutritionists hired by the international egg producers association recommend we eat a maximum of four eggs per week, although a study by the Harvard School of Public Health found that there is no significant link between eating eggs and developing cardiovascular disease in healthy individuals. Most eggs sold today are infertile because there are no roosters housed with the laying hens. There are no nutritional differences between fertile and infertile eggs. Eggs contain all nine essential amino acids, making them a complete protein food. An egg shell has as many as 17,000 pores over its surface. It is said that a mother hen turns over her egg as many as 50 times per day. 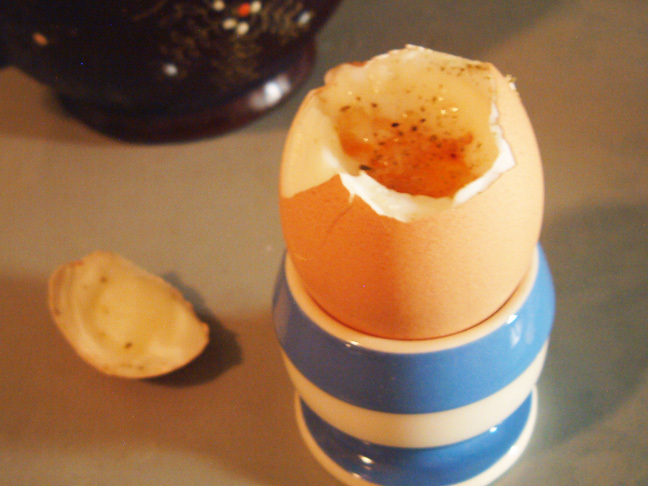 This is done so that the yolk doesn't stick to the inside of the shell. A fresh egg will sink in water, but a stale one won't White shelled eggs are produced by hens with white feathers and ear lobes. Brown shelled eggs are produced by hens with red feathers and red ear lobes. FYI, I have a few eggs every day and my cholesterol levels went from 255 total to 180 total within a few months. I also quit fast food a month ago and lost about 30 pounds in the process. I needed to fit into my tux for my son’s wedding. It is working for me. I personally think the carbohydrates (flour, potatoes and sugar) are the really bad stuff for your system. NO DOUBT, processed foods are bad, very bad. I have given up fast food (maybe once a month but then I'm careful what I order) and soft drinks. I started walking a couple of miles a day. No synthetic stuff like low fat spreads, I switched to good old butter, when I do need cooking oil I use olive oil, I drink water, tea, and milk. Any way you get the point. I have lost nearly 20 lbs, my chloesteral is down and blood pressure down. I work hard for a living, I am not a setitive person but working does not equal exercise. Now about the eggs. I like egg salad and I can't see making it with runny eggs. But on the other hand, I grew up in the southern US and I like my eggs fried over easy (yolks runny) with grits. What to be healthy DO NOT EAT PROCESSED FOODS ... no another animal eats the stuff ... only dumb humans ... and the pets we keep ...Poor dogs and cats letting them get KILLED by us because we feed them human made stuff.. Shell the eggs and mash well in a small bowl. Add curry powder and mayonnaise. Mix well. I say bring on the battered spam fritter, chips (the english sort of course) and a couple of pickled eggs, all washed down with a nice pint of Boddingtons. Or a traditional english sunday roast washed down with anything traditionally british. aah yes bring it on. I can almost taste it!! Anyone Know when HT is goign to open again?